Small Distichodus makes a great community fish not because of their friendly behavior being able to mix with the other tank mates but also due to their attractive coloration, appearing in multiple shades and tones depending on the species and age. They are known to be gentle herbivorous plant-eating fish but sometimes their behavior can become quite unpredictable especially when the aquarium gets too crowded or due to the addition of new pet fish belonging to the same genus. However, it remains a general consensus among the aquarist that you can safely add them together with some other different aquatic life forms like the African catfishes, large shrimps (not the tiny ones as they will get eaten), characins, gourami or even non-aggressive cichlids like firemouth, mbuna and peacock cichlids. One word of caution however, since they consume only vegetable based materials you will have difficulty establishing a healthy population of live aquarium plants as they will tear apart the leaves and eat as foods. Not all distichodus are readily available in pet stores. In fact, it is very rare to see one being offered for sale unless there happens to be a request from somebody willing to pay for the shipment and get them imported to the country. Furthermore, due to increased level of pollution in their natural habitat and overfishing for the aquarium trade, their population in the wild have since dwindled, although not up to the stage of extinction. Not many people actually know about this type of fish and its existence, and more over some will often get confused and wrongly identify them as belonging to the barb species, in which both are totally not related to each other. According to wikipedia and other reference book sources, there are different species numbering at least 23 that make up the whole genus and tracing back to their natural origin in the wild, the fish actually belongs to the lakes in Africa centered around Angola, Zaire and Congo basin. According to some hobbyists who have kept the freshwater fish as pets, the hardest part of keeping distichodus is about making them adjust to your artificial living condition in the tank. Because of this, they have low survival rate especially those native newly acquired species brought right from the wild. Overall, most would agree that this fish can be grouped into the exotic list since you can’t really get them anywhere as ready stock. Attempts to breed them as pets in home aquariums have so far not really been successful and even if the fish managed to produce offspring, there's high percentage that it might not reach towards the adult stage. Few of the most commonly found species are the D. affinis, D. notospilus, D. noboli, D. lusosso and D. sexfasciatus (six-barred distichodus, recognized as the most colorful of all). Aquarium maintenance with only distichodus living in the tank is pretty simple as you do not need to commit long hours doing the cleaning as long as you have a high powered filtration system in place. I have seen them kept in large enclosure such as the juwel Trigon 350 liter tank and they fit perfectly well into the setup without any problem. Considering their length which can extend up to very long (up to 30 inches depending on the species), you should never buy an undersized aquarium which will confine them to tight living space and make it difficult for them to swim around as they are unable to turn their body and move to the opposite direction due to the elongated shape. In order to create the perfect aquarium design to house your pets, you can opt for the rocky type of setup filled with stacked caves and bogwood or if you chose to have live plants instead, you should go for anubias since this won’t get easily eaten by your fish. 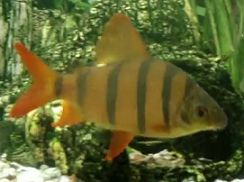 Likewise when it comes to feeding, make sure that you provide sufficient foods like peas, lettuce, cabbage and spinach which they will readily devour and when it comes to routine water changes, just make sure that you do not perform more than 50% total capacity of the tank in order not to upset the environment. Distichodus when startled, will dash around the tank easily injuring themselves in the process and most of the time you have to ensure that the top aquarium lids are always covered or else they may even jump out from the enclosure. Some people find that adding African catfishes to be their companion seems to be the best option as their presence will help the distichodus acclimatize and provide the sense of feeling that they are at home in the tank. Other than that, if everything else is taken care of and food is provided in the right quantity, the distichodus should be able to live and survive for many years.